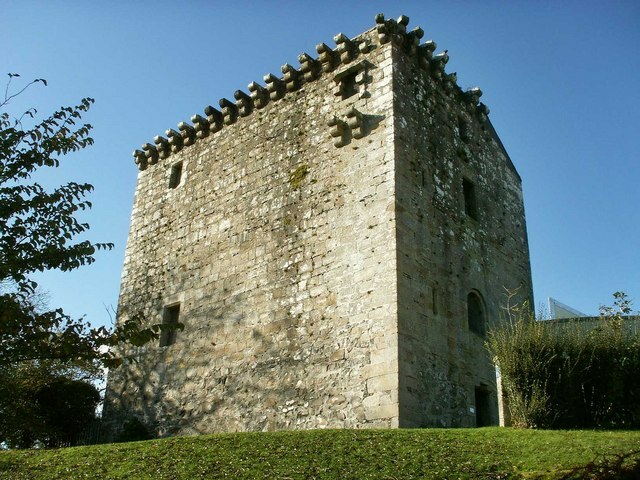 The castle of Mearns was built on a rocky eminence about a mile southeast of the village of Newton. It is probable that the castle was built on the ruins of a previous castle. The license to build a castle was granted by King James II to Herbert, Lord Maxwell, on the 15th March 1449, and conferred on him full power to build on his lands lying within the barony of Mearns, in Renfrewshire, a castle or fortilace; to surround and fortify the same with walls and ditches; to secure it by iron gates; and to erect on top of it all such warlike apparatus as might be necessary for the defense thereof. The castle of Mearns which Herbert, Lord Maxwell constructed was a three story quadrangular tower measuring 44 feet by 29 1/2 feet, and 45 feet to the top of the corbels. The eastern wall where the doors were located is ten feet thick, but the other walls are six to eight feet thick. The castle was capped with a parapet carried on widely spaced, large three member corbels. The roof was apparently a flat platform roof rather than a gabled roof which was normal within a parapet. The Castle was surrounded by a wall and ditch and the entrance was secured by a drawbridge. The ground floor is vaulted and from the entrance there is a straight mural stairway leading to the first floor Hall which measures 27 3/4 feet long by 16 1/2 feet wide and 21 feet high with a vaulted ceiling. With such a high ceiling it would be normal to have an entresol at one end of the hall, but there are no corbels to carry the timbers for an entresol. The height appears to have been to allow for a minstrels gallery in the east wall that was entered by the turnpike stairs. The original main entrance into the hall was through an arched doorway that was reached by removable stairs. This door is eleven feet above ground level and has been blocked up. To the left of the doorway is a lighted mural closet. At the opposite end of the hall is a fireplace with windows with stone seats in the side walls. The upper floor was accessible by turnpike stairs in the northeast corner. This floor is very similar in arrangement to the first floor. From the mural closet on this floor a garderobe was projected out on the south wall. It was carried on corbels which are still visible. For several hundred years, Mearns Castle was used as one of the principal residences of the Maxwell family. In the summer of 1594, Lady Elizabeth Douglas, Countess Dowager of Mortoun, resided at the castle following the death, in the previous December, of her husband. John, 8th Lord Maxwell, was mutilated and murdered after he had been injured in a skirmish with Sir James Johnston of Dunskellie at Dryfe Sands near Lockerbie, Scotland. After Johns death, Mearns passed to his eldest son, John, 9th Lord Maxwell, when he was about seven years old. Because of Johns determination to revenge his fathers death at the hands of the Johnstons, the King commanded him to live in Clydesdale and not appear in Dumfriesshire. Therefore, he used Mearns Castle as his residence for several years. In the summer of 1601, he returned to Dumfriesshire, plotting his revenge on his rival. On the 6th April 1608, he met and shot the Laird of Johnston, for which he was beheaded at the cross of Edinburgh, 21st May 1613. The lands and Barony of Mearns continued in the possession of the Lords Maxwell and Earls of Nithsdale until about 1649. Robert, 2nd Earl of Nithsdale, found himself in financial difficulty because of the debt his father had incurred in support of King Charles I. In order to ease his financial burdens, he sold Mearns to Sir George Maxwell of Pollok. In 1660, Mearns passed out of the Maxwell family when Sir George Maxwell sold it to Sir Alexander Steward of Blackhall. In 1971, the castle was used to link to new buildings of the Maxwell Mearns Castle Church. This Church of Scotland congregation serves the Glasgow suburb of Newton Mearns.